The hype for this event seemed to be massive on Twitter, and surely a lot of that came off the back of the success of The Loneliest Girl In The Universe, Lauren’s third YA novel. It was the most talked about book at YALC this year and had a huge release back in September during the height of the space themed novels that hit our shelves. 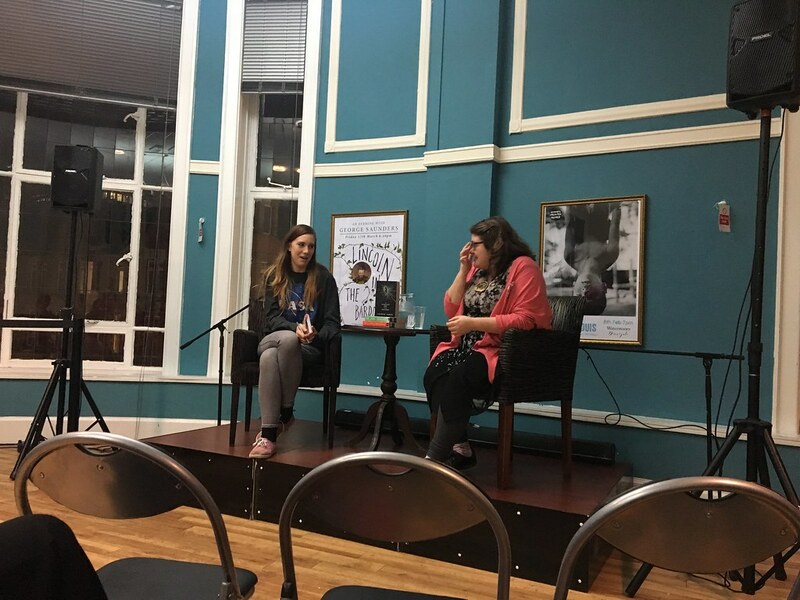 Waterstones kindly hosted An Evening With Lauren James which allowed us to listen to Lauren talk about her latest novel and get our copies signed. There was a lot of talk during the event about the science that was centered within the novel. Lauren studied chemistry and physics at university and wanted to include facts that readers might not have known throughout the novel. She thinks reading novels that involve little facts about whatever topic are a great way to learn things. This lead on to the question of what does she read and where does she get her inspiration from? It was revealed that Lauren reads a lot of non-fiction for fun, science based obviously. So many of her ideas especially for the last novel, have stemmed from some kind of science non-fiction book in which she has cleverly twisted in to fiction. She also took inspiration from Anne Franks Diary for The Loneliest Girl In The Universe due to the idea of the main character being trapped and unable to get out of a situation, this is quite prominent in Romy’s character i feel, where Lauren also said she wanted her to be competent within the tasks she was doing but doubtful as a personality trait. A lot of the audience based conversation was down to the way Lauren actually writes her stories, her as an author and how she manages to actually put words down on paper. When asked what the best writing advise she was ever given was, Lauren responded with “Don’t listen to writing advice … Everyone writes differently, do it in your own way.” Which i think everyone in the room agreed that it was the most useful and least useful way of thinking about writing. As a creative writer myself that is struggling to find my own style, i think i might have to think about the idea of ‘everyone writes differently’! She went on to explain that when she finds herself unable to go on with writing, reading over what she’s written recently and finding where a character has made a wrong turn was incredibly useful. I have never personally thought about writing in this way and i’m really glad i came across that insight. I think that advice will help a lot of budding authors who have hit a wall with a story. Go back and find a point in which you can take another path with a character. I’m always very intrigued about how an author comes up with their characters. I feel like one of the most difficult jobs in writing is creating a complex and believable human being. Lauren said that she creates the plot first with the details of the story, and then bases the characters personalities on the actions they will take in the story itself. For example if a character does something very ditsy in the story, she will have to write the character as ditsy to make it believable. I’ve never thought about writing characters in this way, i’ve always let characters dictate actions, so maybe trying things out this way will make a difference to my own writing. To wrap-up the evening, Lauren said that if you liked The Loneliest Girl In The Universe, you might like We Were Liers by E Lockhart and A Closed and Common Orbit by Becky Chambers. Lauren was such a lovely person to meet and it was interesting to hear about her writing process and the science behind her novel. This book definitely deserves the hype that it’s getting.